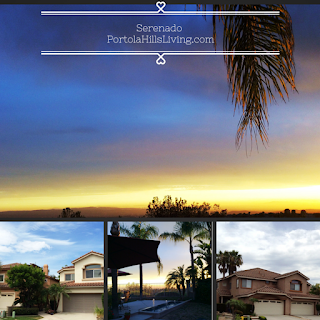 The Seranado tract in the Portola Hills community of Lake Forest is a great community of paired homes. What's a paired home, you might ask? A paired home is 2 single family attached homes on a lot, owned by 2 separate homeowners vs. a duplex where 1 homeowner owns the entire property. These homes offer a wide range of amenities, depending on the floorplan, including fireplaces in the master bedrooms, open and bright structures with high ceilings. Depending on the location, many of the homes offer amazing views of either the Saddleback Mountains or Pacific Ocean with nice size yards. In addition, as part of the Portola Hills II HOA homeowners have access to a great community pool, spa, infant pool, bbq, play yard, gym, clubhouse, volleyball and tennis courts. I guess in full disclosure I have to note why I like this complex so much... I walked in and knew instantly this is where I belong and made it my home! Before I bought here, I was a condo owner and found this was the perfect move up property. Though it is attached, it truly feels like a detached single family home. Currently homes are being sold between $575k-$650k. Comparing this pricing to the new homes at Camden Square in Foothill Ranch which are about the same size, I think you would agree these are a great value!! If you are a homeowner in the Serenado tract and thinking about a move, please do not hesitate to contact Kelly Turbeville to review the current real estate market. Homebuyers if you would like to be kept informed of availability of one of these homes, also contact Kelly to be included in our Serenado waiting list. Below is a look at what has sold in the Serenado tract so far in 2015.